On the plus side : Breakfast on the sunny terrace on nice days. Nestled in an old house tastefully decorated, this friendly youth hostel defines itself as a lodge in the heart of the Plateau. 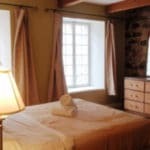 Open only between June and August, the Gite du Parc La Fontaine offers about 30 beds spread out between 4 to 6 bed dorms and a few double rooms. Comfort is basic but the place is clean. A lot of equipment is available to the clients: shared kitchen, laundry, TV room, BBQ, and breakfast on the terrace on sunny days. The Gite du Parc La Fontaine is located in the Plateau neighborhood, the most typical area of Montreal but it stands away from the main touristic routes. Nevertheless, one can easily walk to the Latin Quarter and the Quartier des spectacles within a few minutes. The Sherbrooke metro station (line 2 – Orange) is close by.